In the modern time, products can be manufactured using advanced technology that involves the use of software, hardware and firm ware. 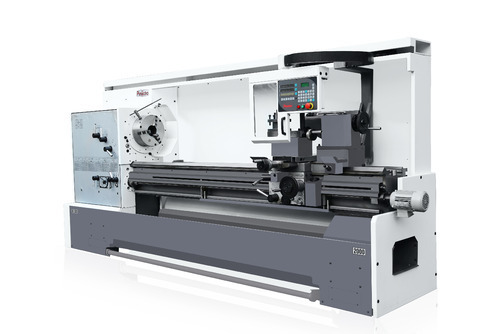 It is required to use CNC lathe machine to receive more accurate specifications and non-uniform shape. Therefore CNC machines are becoming more and more crucial in advanced industrialization. There are several traditional lathe machines used in our country. To create a new advanced developed country, it is needed to transform these traditional lathe machines into semi-automatic control lathe machine through retrofitting. Developing and changing into semi-automatic control lathe machine, three parts are required- mechanical, electronics and hydraulic. From the mechanical perspective, a ball screw in place of lead screw is replaced for better accuracy and eliminated some unwanted part such as gears to provide more space for motor. Additional plates are added for configuration of motors. Moreover, gives a hydraulic circuit for coolant. From electronic perspective, a servo/stepper motor for X and Z axis are used to provide controller for the supreme operation. Retrofitting refers to the inclusion of new technology or features to the traditional system. Retrofitting is a process to replace the CNC, servo and spindle systems on a mechanically sound machine tool to increase its service life. Redeveloping and recreating usually include a CNC retrofit. The expected advantages include an economical investment than buying a new equipment and an upgrade in uptime and availability. However there are usually other unexpected advantages to retrofitting including reduced energy costs, better functionality and advanced level of manufacturing data accessibility. Considering the machine tool is usually in suitable shape, CNC retrofitting is often the cheapest solution to enhance the overall functionality of an older machine tool. Redevelopment usually includes repair or replacement of some damaged mechanical parts like ball screws, lubrication pumps, safety interlocks, guards, belts and electrical wiring. Remanufacturing goes to an additional step to repair or replace mechanical components to the original. It is feasible that the machine will be fully diassmebled, cleaned, checked, repaired and painted. Upgradation package is economical and more easily justifiable.